Buy your Sniffer GPS today! Sniffer GPS is the only dog collar you will ever need in one, sweet package. GPS Tracking sees your dog anywhere they go, and tells you exactly how to find them. Sniffer navigates you to your pet with google maps, see the app in action! Set Virtual, GPS Protected Dog Fences wherever you go! A high frequency training tone activates near the edge of your safe zone, training dogs not to stray off. We put flexible solar panels right on the collar, that’s right. With power saving techniques and solar power, Sniffer keeps going for up to 30 days without charging. For the best nighttime visibility, we decked out our collar with bright LEDs in 32,000 adjustable colors. Keep track of your dog’s health with our built in activity monitor. Activity monitoring includes: Health alerts, flea and tick reminders, Calorie tracking, sleep, walk, and play time, steps, goals, and any dog related appointments. Due to our amazing flexible solar panels, if the battery dies, the collar doesn’t! Solar panels keep the collar working wherever there is light. We know dogs like to get dirty, so we made our Sniffer collar to keep up. It's waterproof in up to three feet for 30 minutes, so go for a swim. Dirty? Throw it right in the washer to clean it up. GPS doesn’t help when the collar is on the table charging, so why take it off? With our easy snap on charger, the collar charges on the go so you don’t have to stop. Some collars take 15 minutes to show your dog has run off; that’s 2 miles or running! We update every 30 seconds for fast, reliable information. 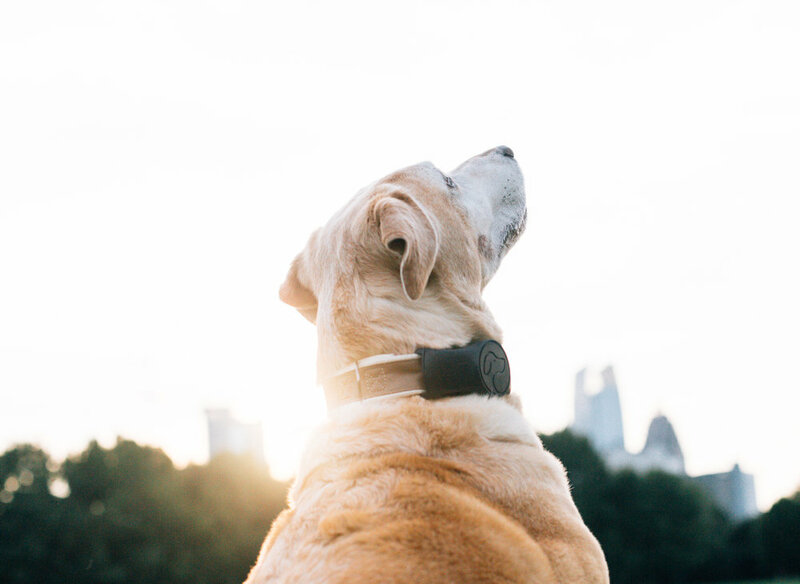 Receive an Alert whenever your dog escapes the safezone on the device most convenient to you, whether it’s your phone, email, or even your Alexa device. Sniffer connects to nearly every major cell provider to maximize coverage. It even connects to WiFi and bluetooth! Our high pitch training tone works with bluetooth or wifi to create a virtual leash for your walks and other outdoor activities! Our collar is built tough, but also for comfort. The wider collar takes pulling and tugging better than most, so you’ll never need two collars. If you love your current collar’s style, Sniffer’s device is easily removable and will fit most any collar! With our simple Tri-glide, the collar easily adjusts to fit any dog in the collar’s size range. And with our buckle clasp, the collar can be easily removed at any time. Sniffer GPS comes in a variety of colors, including a community chosen Indiegogo color! A survey asking what color you want your device and collar to be, will be sent out at the end of the campaign. Our journey with GPS dog collars started twenty years ago when our founder, Reid Kersey, had Blue, a puppy who just loved to get out. Blue was more than just a pet — she was Reid’s therapy dog after his father passed away. And every time she got out … well, you can imagine. Fast forward ten years and Reid was a student at Georgia Tech working part time. His boss had a GPS tracker for his dog — but it spent all of its time on the charger because the battery didn’t last longer than a day. Every time the dog got out, the GPS was useless because it was too time-consuming to take the collar on and off daily for charging. 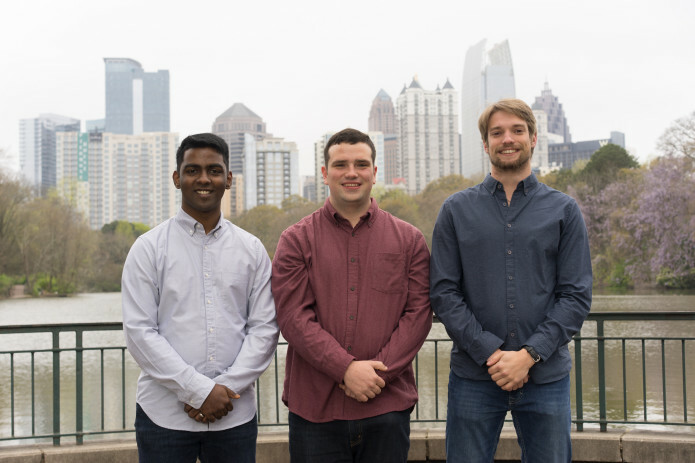 Knowing there was a better way to track pups, Reid took his idea to his business program at Georgia Tech and got to work designing, developing, and researching the idea with Aaron Naidu. At the end of the semester, the duo walked away with a working prototype, and Sniffer was born. Along the way, Austin Bush joined the team, becoming a full-time partner and founder, as well as the lead mechanical engineer for the company handling product design and manufacturing. The American Humane Association estimates that 10 million dogs and cats are lost or stolen in the U.S. every year — and 700,000 of them never make it home. That’s because on average a dog can run 15-20 miles per hour, which mean your pup could be miles away in a very short amount of time. There are a lot of tracking products on the market, but none come close to the functionality, health monitoring, and battery life that Sniffer offers. We’re dog lovers but more importantly, we’re dog parents. And we take that role very seriously. That’s why we built Sniffer, because we sleep better at night knowing that we’ll never lose track of our family, and we know it’ll help you sleep better at night too. So here’s to a safer future, where there’s no such thing as lost dogs. How is Sniffer GPS different from a microchip? A microchip is like a dog tag, someone has to find your dog, take it to the vet or a shelter, and scan for the chip in order for it to work. This can take multiple days, and even then, complications with the chip can occur. Sniffer GPS tracks your dog’s location in real time, and alerts you immediately if your dog runs off, so you can find your dog in a matter of minutes. Yes, Sniffer is IP67 rated, which means Sniffer GPS can be submerged in up to 1 meter of water (3.3 ft) for 30 minutes without damage. Feel free to let your dog jump in the water and go for a swim. Can I use Sniffer GPS with more than one pet? Yes, each dog has their own profile within the Sniffer GPS app, and the app can track all your pets simultaneously. There is no limit to how many pets you can add under your account. Does Sniffer GPS attach to my cell phone plan? No. No need to worry about adjusting your current cell phone plan. Sniffer GPS uses its own network that we provide. We offer a 1 year warranty on the device and accessories, as well as a 30 day money back guarantee. Can I choose a different color for the device and the collar? Yes. When we being shipping orders, you will receive a post-order survey in which you can choose among the different color options for your order. Yes, all data is transmitted and stored fully encrypted. We utilize TLS to encrypt any data in transit, and all data is stored heavily encrypted on our secure servers, located on the AWS Cloud. Can I change the color of the collar’s light? Yes. The collar’s light can display colors everything in the rainbow and can be chosen in the Sniffer GPS app. You can even tell it to flash one particular color or rotate through all the different colors! Yes. Simply remove the device from the collar and throw it in the washing machine, solar panels and all. Do I have to use the included collar? No, the device can attach to most collars up to 1.5in wide. However, since the included collar has the embedded solar panels for charging and the integrated high vis light, you would be giving up those features. Can I use Sniffer GPS on a harness? Sniffer GPS will fit most harnesses and collars, however, because we can not guarantee a fit for everything, Sniffer GPS has a 30 day return window if it doesn’t fit your dog’s favorite harness or collar. Sniffer GPS is accurate within 3 feet. It also averages multiple locations together before updating you to prevent false alarms. Can I see my dog’s location history? Yes, your dog’s location history is stored for one month, and you can view wherever your dog has wandered on the Sniffer GPS app. You can use this data to make sure your dog is actually getting walked by the dog walker, see all the places that your dog has traveled, or just see where they go when they wander. What does the subscription cost? The first year of service is free for all of our backers. After that, it is only $5 per month, with no commitment. Why is a subscription plan required? Our device uses cellular service to communicate with your phone, updating you as to where your dog is located. Unfortunately, this cell service comes at a cost, and so a subscription plan is necessary. No. You don’t need to worry about adjusting your current cell phone plan. Sniffer GPS uses its own network which works out-of-the-box with the device. Can I attach Sniffer GPS to my already existing phone plan? No. Sniffer GPS uses a unique service plan of its own so that it can protect in a wide variety of places. As such, this plan must stay apart from any personal phone account. Does Sniffer GPS work in my country? Yes. Sniffer GPS operates with dual mode LTE M1 and NB1 with a 2G(GSM/GPRS) fall back. This is a world certified mobile network device that really can operate almost anywhere in the world. Will Sniffer GPS work if I am outside cellular service? The device’s GPS capabilities are always working, but if your phone is in an area with no cell service or WiFi connectivity, your phone will not receive updates from the device. The same is true if your dog is in an area with no cell service or WiFi coverage. However, multiple phones can receive the same dog’s location updates and while you might not be receiving updates in Antarctica, someone back home with the app can still know your dog is safe. We offer free shipping to the United States. Shipping to other countries will cost a nominal fee that is displayed at the payment section. Do you ship internationally? What are the fees? Yes. Since Sniffer GPS can work in over 194 countries, it is available to ship anywhere in the world. When you back our campaign, simply select your country and the corresponding shipping price will be listed. Our mission is for you and your pet to make the most out of every moment you share together. So it’s our hope that you are entirely satisfied with Sniffer GPS and its functionality. If for any reason you are not satisfied, we accept returns for a full refund (less shipping both ways) within 30 days of receipt, for unused products in their original packaging. Can I send a device as a gift? Yes. Send us a message at contact@sniffergps.com with your name and order number and we will specially gift wrap your order before sending it out. Money back guarantee: What if the campaign goal is not met? If the Campaign Goal is not met, everyone who purchased a Sniffer Collar will receive a full refund. Everyone who purchased a shirt, will still receive their shirt. Have other questions or any suggestions?